So, who knows what this is? This is the Freedom From Religion Foundation's "Emperor Has No Clothes Award." Daniel Dennett was the recipient of it some years ago. It's based on the Hans Christian Andersen story, you know, about the young boy who said, "He has nothing on! The Emperor Has No Clothes." 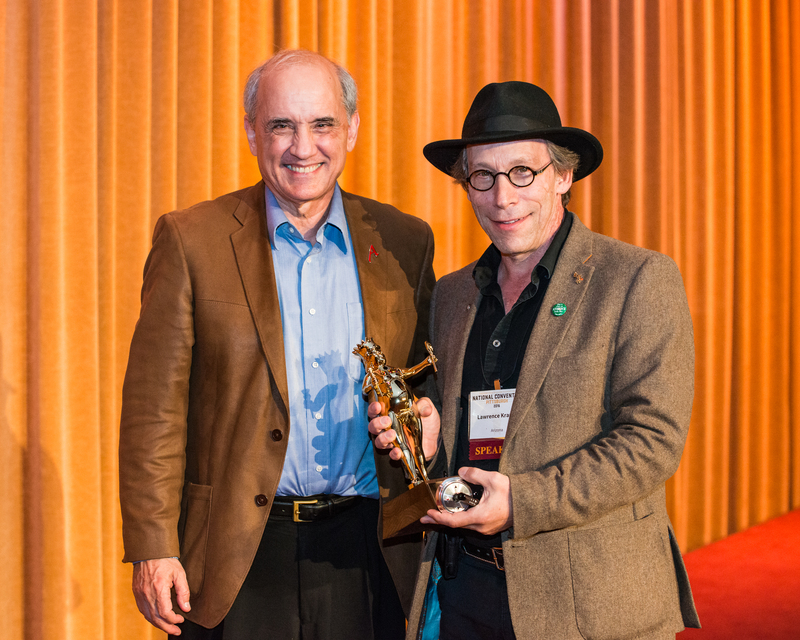 We're going to give this award tonight to Lawrence Krauss. The first award was given back in 1999 to the physicist Steven Weinberg. He was the first one to receive it. Other recipients include Ron Reagan; Ursula K. Leguin, the science fiction writer; Daniel C. Dennett, of course; Christopher Hitchens, who came to Madison to receive it; Julia Sweeney; Charles Strauss, the Broadway composer who wrote "Annie" and "Bye Bye Birdie" who's still alive and still wanting to write more songs about atheism; Richard Dawkins; Donald C. Johanson, the discoverer of Lucy; Sean Carroll, the physicist; and last year the award was given to the Nebraska Senator Ernie Chambers. He is an atheist in government who sued God, by the way. This award is given to public figures who make known their dissent from religion. Tonight, we're very honored to be able to present this statue to someone who embodies the award and outspoken atheist. He happens to be an internationally known theoretical physicist — Professor Lawrence Krauss. His studies include the early universe, the nature of dark matter, general relativity, neutrino astrophysics. And by the way, Lawrence, this is made out of Higgs bosons. It's really heavy, this is. He has investigated questions ranging from the nature of exploding stars to the origin of all the mass in the universe. He grew up in Toronto, received his undergrad in both mathematics and physics at Carleton. His Ph.D. in physics from MIT. He joined the Harvard society of fellows at Yale faculty as an assistant and associate professor. And in '93 was named Ambrose Swayze Professor of Physics, Professor of Astronomy and Chair of the Department of Physics at Case Western Reserve University. In 2008 Krauss became the foundation professor in the School of Earth and Space Exploration and physics department, and the inaugural director of the Origins Project at Arizona State University. This is an exciting national center for research and outreach on issues ranging from the origins of the universe to human origins. Also origins of consciousness and culture. The center hosted in a symposium in 2009 which brought together many of the most well-known scientists and intellectuals in the world, and attracted five thousand people. Lawrence Krauss is author of more than 300 scientific publications. He's received numerous awards for his research and writing. He's authored more than a dozen books including A Universe from Nothing: Why There is Something Rather than Nothing, which he'll be signing after his speech tonight. And he also wrote a book called The Physics of Star Trek. His upcoming book will be called The Greatest Story Ever Told, and he won't be able to sign the book but we'll have some postcards and some bookplates that he'll be able to sign for you after the talk today. He spearheaded national efforts to educate the public about science. To ensure sound public policy, defend science against attacks and to lead a national effort to defend the teaching of evolution in the public schools. His piece in The New York Times, followed by a public letter to Pope Benedict, helped to prompt a re-evaluation of the Catholic Church's position on evolution. He led the creation of a group in Ohio that recruited and supported pro-science candidates to run against creationist candidates for the state school board. All of those candidates were elected. In 2007, Lawrence Krauss wrote to the Wall Street Journal proposing a presidential debate on science. Wouldn't that be something? Which is now a call co-sponsored by the American Association for the Academy of Science and endorsed by 20 Nobel laureates and 12,000 scientists. He and his good friend Richard Dawkins co-star in a full-length documentary movie that's really fun. It's called "The Unbelievers." It's kind of like a rock-n-roll tour documentary, but with rock-n-roll scientists. It follows them around the world as they talk about science and reason. He enjoys scuba diving, fly fishing and mountain biking. He served as a jury member at the Sundance Film Festival. He's performed with the Cleveland Orchestra and, really important to the Freedom From Religion Foundation, he has just agreed to join our distinguished list of honorary directors. Thank you, Lawrence. And you may have caught his really terrific piece in The New Yorker in February after the death of Scalia, "Put an Atheist on the Supreme Court." In that article he wrote, "Our strange attitudes about atheism warp our politics and our laws. It's time to remove the stigma attached to atheism. One way to do that is by appointing an atheist to the Supreme Court. It would be a tribute to the secular principles upon which our country was founded." So, Lawrence Krauss, where are you? Come up to receive The Emperor Has No Clothes award. Thank you very much. This is a great, it's an amazing, an amazing award. And I will put it proudly in my living room now for all to see and be surprised about it. It amazes me. When I get awards like this, I think, with a group of people that have been awarded it before, and it's an amazing group of people. And this is truly an amazing organization, so, for me, I feel very privileged to be here and to be speaking to you. And I'm going to speak about physics because I told them that's what I was going to speak about. But first, I have a confession. My real name isn't Lawrence Krauss. No. Just joking. I couldn't resist. Because my friend Dan is here, I retitled my talk to apply to metaphysics because he's a philosopher. What I want to do today is talk a little bit about, since this is Freedom From Religion, about an example of the way science treats problems that that seem like they're not solvable or seem like they might be almost metaphysical or religious. And the way we the way we treat them as we try and turn them in is science. And I want to talk about this because it's an incredibly exciting discovery. The great thing people go to church for, I guess, is to escape from the real world, and the good thing about cosmology is it gives us perspective, too. We get embroiled in the petty problems of the world around us, and one of the great things about the field that I work in is that it points out that those problems are really irrelevant. So, it's the best of times today. But what I mean by that is that the Large Hadron Collider is turned on in Geneva and it didn't create a black hole that destroyed the world. But it's also the worst of times. The great thing about cosmology is it has different pictures. And this is the picture I wanted to talk to you about today, first. This is a most recent Hubble Space Telescope deep field picture. It's called the multi-chromatic version, which means all of the colors are real, and every spot in that picture, every dot that you can see is a galaxy, not a star. There are over 100 billion galaxies in the observable universe, and those small, faint, blue galaxies, which I could point to if I were actually standing in front of that, are about eight or nine billion light years away and that means that the light from those objects took eight or nine billion years to get to us. Now that means that the light came well before the Earth and sun formed because the Earth and sun are about four-and-a-half billion years old, in most states. And so the light left well before the Earth and sun formed and since the lifetime of a main sequence star, like our sun, is about 10 billion years and a lot of those things are nine billion years old, or the picture is nine billion years old, so now it's nine billion years later. That means many of the stars in this image are no longer around. They burned out. And any civilizations around those stars have burned out. Any civilizations that had awful presidential candidates have burned out. They're gone. No one's going to ever know about them and their history. And similarly, if the light from our sun is captured by, eventually, any other civilization that might go around a new star and one of those systems. It'll take a picture. You know, it may see us but they'll see us 10 billion years from now and by then our sun will be gone and our civilization will be gone and no one will care. It's over. And that's just the way it is. And, therefore, it doesn't matter, all the garbage we have to deal with today, 'cause this too shall pass, as I think it says in some book. When you look at this image the first thing that you may ask, although it won't be the first thing you'd ask, is where is this picture? Which direction in the universe is it? And the answer is, it doesn't really matter, because every direction in the universe looks identical. There are the same number of galaxies out there as out here. Anywhere you look there are the same number. Now that may not seem strange, but it should seem strange to you because if you think about it that end of the universe, the universe is 13.8 billion years old, and that end of the universe, if I see light from almost that far, and I see light from almost that far, that means those two regions couldn't have communicated before today. Nothing, no information, could travel faster than light. And, if they couldn't have communicated 'till today, how come that region knows to look exactly like that region? It's not God, OK? That's a real problem, that metaphysical problem, was one that led to much of the research in physics that I now have been involved in. We think we have a solution to it. But to understand that we have to think about the origins of the universe. Now when we look at this picture we're looking, nine light years away is pretty far. But the universe is 13.8 billion years old. And if we want to understand how the universe got the way it is, we want to look back to the beginning of time. It turns out we can't look back to the beginning of time using light. If we do, this is as far back as we can get. This picture here. This is the cosmic microwave background radiation. It represents a wall in the universe, essentially. If I try and look outside this room, I can't look outside the wall because it's opaque. If I shine my laser beam at that wall it can't get through, it bounces off. Well, if we look back in the early universe, earlier and earlier and earlier, the universe was hotter and hotter and hotter, and at a certain point it was so hot that neutral matter couldn't exist. And electrons are stripped away from protons, and you formed a plasma. And that material is opaque. So if we try and look back to the beginning of time, we can't because between us and the beginning of time, the universe was opaque. We can only look back to the time, the moment, the universe became transparent. Just like I can look back at all the way to that wall over there because the air is transparent. I can see all the way to the wall. Well, this is looking back at a spherical surface located almost 13 billion light years away from us. It turns out we're looking back at the time when the universe was about 300,000 years old. Now it doesn't look like a spherical surface, that's because I've projected it on a plane. My wife is from Australia and so I hate to be northern hemisphere-centric. But the projection of the Earth is the same projection, in fact, that I have for this. So this is the plane of our galaxy, and that's looking up and that's looking down. Now the galaxy emits a lot of stuff here, but we can get rid of the galaxy. And then this is a baby picture of the universe. A neonatal picture of the universe, when it was about 300,000 years old. And color here represents temperature. So there are hot spots and cold spots. And this is before galaxies, before stars formed, and it looks like the universe has a lot of lumps, and it does. Except, they should have magnified. The average temperature of this radiation coming at us today is about 3 degrees above absolute zero. It was 3,000 degrees when it left at that surface, but the universe has expanded by a factor of a thousand in that time, and it's cooled and it's now 3 degrees. And it turns out the difference between the hot spots and the cold spots here is 1/100,000 of a degree. So, this is actually incredibly smooth. Far smoother than the surface of the Earth if you look at a map of the earth. And that, that exacerbates the problem I told you about earlier. The galaxies may look the same everywhere, but why is that temperature of the universe the same absolutely everywhere? Because that region could never have communicated to that region. That's one question. The second thing is where did the lumps come from? Because these lumps are important because they're going to collapse to form all the stars and galaxies and everything you see in the visible universe. Well, it turns out, we think we understand that too. The same thing solves both problems, turns out. And it's really kind of amazing. These come from quantum mechanics. It turns out, we think quantum mechanical process in the early universe produced all the lumps I'm seeing in this room. All the lumps we see in the universe. We talk about macroscopic quantum mechanics nowadays. Quantum computing, all sorts of neat things. But, in fact, the universe is an example of macroscopic quantum mechanics as you'll see in a second. In any case, this is really neat. This is looking back, but it's not looking back at the beginning of time. If we want to try and understand where all this comes from, we've got to look back through that plasma. If I want to look through that wall, I might want to use X-rays, right? Because I could see through the wall. I've got to find something that will, in this case, not interact strongly with all that material so it can come from the Big Bang all the way through that plasma and get all the way to our eyes today. Well, we have to think of something that interacts much more weakly than light because light can't make it through. So what's the weakest thing in the universe? Gravity. This is an educated audience, that's great. Some of you may not feel that gravity is weak. Especially those of you who got up this morning early, like me, to get to a plane here. But that's because the entire Earth is attracting every atom in my body. But the gravitational force between each of my atoms and every atom in the Earth is so small you'd never be able to measure it. So, gravity is much weaker than electromagnetism. Now, about 200 years ago, James Clerk Maxwell showed us that if I shake an electric charge, I produce an electromagnetic wave. I produce radio waves or light. So this was the theory of electromagnetism. If I shake an electric charge, I produce an electromagnetic wave. Einstein in 1916 demonstrated that gravity was really an effect of the curvature of space. That space itself responds to the presence of matter and energy by curving, by expanding, by contracting. And, therefore, each of you is curving space around you, but not by any amount you can see because gravity is so weak. But every time I do this (waving his arms around), and I do this a lot, I'm creating a disturbance that's changing and that produces a ripple of disturbance in space that travels out at the speed of light. Not an electromagnetic wave, but a gravitational wave. And Einstein said in 1916, if gravity is what I think it is, then there must be gravitational waves, and every time I'm doing this I'm producing a gravitational wave. Now, what happens when a gravitational wave goes through this room? There are a lot of them in this room right now. There are ripples in space, distortions in space. So when the gravitational wave comes from the distance between those walls gets smaller and the distance between the floor and the ceiling gets larger, and then it gets smaller, and that gets larger. And that's happening right now. Most of you, well it varies on how much you drank before you came here, you don't experience that, and that's because gravity is so weak! It's so weak that we don't see this, but it's there. And if we could use gravitational waves, if we could measure them, it would give us a new window on the universe. So we've tried to measure gravitational waves. Let me show you what a gravitational wave would look like if it's, um. If this gravitational wave is coming out from behind the screen, that's what the screen would be doing. It would be getting smaller and larger in that direction, and smaller and larger in that direction. And, you know, this is a three-dimensional picture of it here, but three-dimensional images have no information. But they look pretty. So that's what a gravitational wave in space looks like. And people decided, maybe we try and detect these. So we built the largest gravitational wave detector in the world, and here it is. There are two of them actually. This is in Hanford, Washington. There's an identical set up in Livingston, Louisiana. This is called the LIGO Detector, the Laser Interferometer Gravitational-Wave Observatory, but that doesn't matter. It's two perpendicular arms, each four kilometers long, and they're identical. Now if a gravitational wave comes down from above, what happens? This arm will get a little bit shorter and that arm will get a little bit longer, and then this one will get a little bit shorter and that one will get a little bit longer. So all we have to do is measure the length of those two arms and see if one gets shorter than the other. Easy. But, you know, but this is the reason I'm not an experimental physicist. Because we can calculate: The more energetic, the greater the mass, the more violent the mass is moving, the bigger the gravitational wave amplitude. So, when I do this there is not much of a gravitational wave. But if I take two massive black holes, solar mass black holes in our galaxy, or a nearby galaxy, and they collide together, now that's going to produce gravitational waves. So if two massive black holes collide in our galaxy, the most extreme kind of generator of gravitational waves, what would happen here? We can calculate what would happen if two black holes of solar mass size in our galaxy, or in a nearby galaxy collided. Then the length of this arm four kilometers long would change compared to the length of that arm four kilometers long. So this four-kilometer arm would change by an amount equal to one one-thousandth the size of a proton. And that's why I'm not an experimental physicist, because I never believed this would be possible to do. And it is amazing that it can be done, and we've been able to do it. And by we, I mean not me. But if you think about it, it's just remarkable because even the way it works is we send two laser beams down here and we basically measure the time it takes for those two laser beams to go in those two different directions. We compare them in a very special way. But just the vibrations in the mirror, the quantum mechanical vibrations of the mirror, are a lot bigger than the effect you're looking for. So we have to use really fancy, new kinds of techniques, optical techniques, to overcome that quantum mechanical vibration. If a truck hits a pothole over there it will produce an effect far bigger than the effect they're looking for, which is why there are two of them because there's lots of noise happening here. But you see, if a gravitational wave comes by here it takes about 10 milliseconds to get from Hanford, Washington, to Livingston, Louisiana. So, if you look at those two detectors, they have a lot of noise. But if you look at them 10 milliseconds apart and one has exactly the same kind of noise as the other, then maybe you're onto something. And so the way we do it, this is a little video. So we take a laser beam, we split it at the mirror, and what happens is, it turns out, we can interfere those two laser beams with each other because they're waves. So we send this wave out, we split it, and we set up the two interferometers so that, in fact, when this wave bounces back, it comes back to this original mirror and it's exactly out of phase with this wave. And what that means is that two waves cancel out exactly, and on the screen there's just total darkness. When the two, when the things are setup exactly, if you look here you'll see total darkness. But if the length of these two things changes a little bit, then the cancellation will go away and you'll see light and dark spots. And so that would signal, in fact, a gravitational wave. Now this detector was built over the 1990s, and in 2000 it was first built, but it didn't have quite the sensitivity we thought you'd need. It could only detect a change in length equal to one-hundredth the size of a proton. We thought maybe we'd be lucky. We were lucky. So it got upgraded. It got updated and then in 2015 it achieved the sensitivity of one-thousandth the size of a proton, we thought. And so they were going to turn it on and do an engineering run, which is what you do with big, new machines. You don't do the science, you just turn it on and tweak the knobs and get it all working. Ray Weiss, who was the director of this, said you know don't take any data because we're just doing engineering run. But, of course, they didn't listen to him and they turned it on and one hour later they got a signal that we've been waiting for since Einstein. And, in fact, a signal that came from an event that happened 1.3 billion years ago. Here is a gold-plated event of gravitational wave. This is the signal in Hanford, Washington. This is the signal in Louisiana. Now it may not look like much. It's just a little squiggle, but two things I want to point out. This discovery could not have been made before last year because we didn't have the technology — the quantum technology, the optical technology — to build devices that were sensitive enough to this. That's the first part. you can compare it to something you can predict. Because if you can't predict it in science, it's no good. Science is not a story like religion. It makes predictions. And if it can't make predictions, it doesn't matter. In order to be able to make that prediction, it meant we had to be able to calculate what would happen when two massive black holes collided and that is incredibly complex because the gravity is very strong. We never witnessed gravity that strong before. And we needed supercomputers, new mathematical techniques. And those supercomputers didn't exist 10 years ago either. So everything came together. The earliest we could have detected these gravitational waves was Sept. 14th, 2015. And that's exactly when we saw it. And what you can see is there's the data, which is a little noisy, and then there's a curve here. And that's the predictive signal if two black holes collide, and you'll see what they look like in a second. So that's a signal that you expect and the signal you'll see and you see they're virtually identical. More importantly, this is the signal in Livingston, Louisiana, exactly 10 milliseconds after that signal was observed in Hanford, Washington. You put the two on top of one another and they are identical. And so what we discovered, what they discovered, by doing this amazing technology that no science fiction writer would ever suggest you could do, is an event that is equally interesting. This is an artist's rendering by the way, not the real thing. These are two black holes located 1.3 billion light years away. They actually distort, if we could see them, they distort the space behind them because they curve space around them and you'll see that happen. And they will collide, in fact. And this black hole is 35 times the mass of the sun, and this one is 29 times the mass of the sun. Remember that, 35 and 29. And they will collide, and they'll run this thing. It turns out they're orbiting one another, and you see how space is distorted by them because the gravity field is so strong. What's amazing is this 35 solar mass black hole and this 29 solar mass black hole are orbiting each other 200 times a second. Not once a year, like the Earth orbits the sun, but 200 times a second. And in two-tenths of a second, in the final hurrah, they will finally collide, and you see how they shape space? That's the gravitational wave emission. Now, if that didn't amaze you I'm going to prepare your minds even better. So the sun burns a 100 billion hydrogen bombs every second, and that produces the light of the sun, and it lasts about 10 billion years, and during that 10 billion-year period of burning 100 billion hydrogen bombs every second, it will turn one percent of its mass into radiation. So over 10 billion years, a 100 billion hydrogen bombs every second, one percent of the mass of the sun will turn to radiation. Now, remember I told you there was a black hole 35 times the mass of the sun and a black hole 29 times the mass of the sun? Now, I'm going to turn to my friend Dan Dennett here. Sorry Dan, I'm going to put you on the spot. I didn't prepare you for this. But you are a learned man, so I know I can trust you on this. So we got a 35 solar mass black hole and a 29 solar mass black hole. What do you think the mass of the black hole is that is the sum of those two? That's 36 and 29. Very good! Most people would not be willing to say that in public. Sixty-five! There is an intelligent man! Wrong! He did the math right. But what they found was a black hole that was 62 times the mass of the sun, not 65. Where did the rest of that mass go? Three times the mass of the sun was emitted in gravitational waves. Now think about that. Our sun will burn for 10 billion years, 100 billion hydrogen bombs every second, it turns one percent of its mass into radiation. In two-tenths of a second that system emitted three times the mass of the sun in gravitational waves, which means in that in two-tenths of a second it emitted more energy in gravitational waves than all the rest of the stars in the visible universe are emitting right now. That's amazing. You couldn't write this stuff. You couldn't make this stuff up. The real universe is just so much more interesting than the universe of myth and superstition. And we've discovered that this actually happens. Now, that's great and we're very excited about it. This means we're living in a time which is very similar to the time when Galileo first took his telescope and looked up at the moons of Jupiter. He created a whole new field of astronomy. And this will be a new field of astronomy. Gravitational wave astronomy will open up a new window on the universe and, if history is any guide, every time we open a new window on the universe we're surprised. Now this is exciting, but it's not as exciting as what I want to talk about next, which is how these gravitational waves are from black holes that are very interesting. But what about gravitational waves from the beginning of the universe? How can we look for them? This is a device that's been built to look for those. This is the BICEP detector. This is at the South Pole. This is a detector the looks for the cosmic microwave background radiation which only comes from the universe that's 200,000 years old. But, it's looking for an imprint in there that comes from the beginning of time. Now, in order to make this detector work, it's a complicated detector. It's not cold enough for the South Pole. So we have to send liquid helium down in the summertime. And you know why we send it down the summertime? Maybe you know this. I didn't know it 20 years ago, it amazed me. We could go to the moon, we can go to the bottom of this ocean, but we can't go to the South Pole in the wintertime. We don't send planes down in the South Pole the wintertime. So we send this liquid helium down in the summertime and that's why this is one of my favorite images. Yeah this is a sunset, it seems in the BICEP detector, a sunset at the South Pole, which happens once a year. Right. So it means if you're taking this picture, you're stuck there for six months. Which means you're a graduate student. And this detector was designed to look for a signal from the Big Bang. It's actually designed to look for a signal from a moment after the Big Bang. And this is probably the most complicated picture I'm gonna show you. So, I mean, it's a brief history of time. But it is a phenomenon that we think happened when the universe was a millionth of a billionth of a billionth of a billionth of a second old. This is our universe expanding over time today. But we think at a very early moment, when the universe was a millionth of a billionth of a billionth of a billionth of a second old, our universe expanded rapidly, incredibly rapidly, increasing in volume by a factor of 10 to the 90th in a millionth of a billionth of a billionth of a billionth of a second. It went from the size of a single atom to the size of a basketball. And that was because it was an incredible amount of energy stored in empty space. Now, one of the reasons we think that happened is, besides the fact that our particle physics ideas suggest it might, is it also solves that problem that was bothering you after I brought it up and has been bothering you ever since then. How come the universe looks the same in all directions? Well, in our standard picture, the universe is this big and there wasn't enough time for light to ever travel from one end of the universe to the other. But if the universe increased in dimension by a factor of 10 to the 30th, it was once much smaller than we would have imagined, and when it was that small there was enough time for light to travel across it and for the universe to thermalize and become uniform, and that would, therefore, explain this weird phenomenon. But that's postdiction, which is not really good science. But you could also make a prediction, and one is that because the universe was the size of an atom at this point, quantum mechanics is very important and quantum mechanical fluctuations when the universe puffs up will get frozen in, and they'll end up looking like small density fluctuations, like the density fluctuations we see in the microwave background. And if you ask what would they look like if inflation happened, it turns out they look exactly like the ones we see in the cosmic microwave background, which you might say is proof that inflation happened. It's not. Because, to be honest, if they looked different, inflation could have explained that, too. And now if something can't be falsified it's not particularly useful, like God. And so we have to look for something else that would be unambiguous evidence that inflation happened. Well, when you puff up a universe by a factor of 10 to the 90th, when all the mass of the universe gets puffed up by a factor of 10 the 90th in size, now that's going to generate gravitational waves. And the unambiguous prediction is that enduring inflation gravitational waves of all frequencies are generated and we can look for them, we think. And here's a picture, which is unintelligible, but it's from a Scientific American article of mine and I spent about 10 hours with the artist, so you have to suffer through it. Here's looking back in time. Here's the Hubble Space Telescope picture I showed you, and then go back in time to when the universe was 3,000 years old. There's a cosmic microwave background picture. You go all the way back in time to inflation. Boom. Right there. And inflation generates all these fluctuations in gravitational waves, and what happens? Well, let's say the universe is one second old. There are gravitational waves of a period, one second, that have been generated. But they will start to oscillate until the universe is old enough in them to start oscillating. Because when it's half a second, they haven't had time to oscillate. So they start to oscillate when the universe is one second old. But when the waves start to oscillate in an expanding universe, they die off. Then their gravitational waves of period, maybe a year, when the universe is a year old they start to oscillate and then they die off. And then maybe a century. But then there are gravitational waves that period 380,000 years. Which is exactly the point at which the cosmic microwave background was formed. What would they do? Well, here's what they do. Here's what the cosmic microwave background comes from. The cosmic microwave background is caused because you've got free electrons that are about to be captured by hydrogen and before that, just before their capture, they scatter light to your eyes, and that's the picture I showed you. Now, if the universe is uniform all around them, the same temperature all around them, they scatter light in the same intensity in all directions. But if a gravitational wave of period, of the age of the universe at that time, comes by its size is the size of the visible universe at that time. What happens when it comes by? It causes the universe to get a little smaller in one direction and a little bigger in the other direction. And that means the electron will see radiation that's a little more intense in one direction and less intense in the other direction. And when it scatters that radiation, it'll be polarized. That means it'll be more intense in one direction than another. Those who are fishermen know about polarization, perhaps, and those of you who don't like glare have polarized sunglasses. And the reason is when light bounces off water and gets into your eyes, that light is polarized. So say it's vibrating in only this direction. If you have lenses and only let light in vibrating in that direction then you don't see the glare. So that's how polarized glasses work. But if this happened, then it might produce polarization in the radiation that we see in the cosmic microwave background. And here is what we would look for. Here is a picture of the cosmic microwave background, and there's random polarization if there's no gravitational waves. If I gave what gravitational waves were to look like, exactly the same. It's just damn hard to find it. You really can't, you really can't. It takes an incredible amount of work. But, in February three years ago, the BICEP detector was looking for that polarization and they said here's this kind of signal we would expect to see if inflation happened. The signal actually that I'm happy to say I had predicted about 20 years earlier. But it produces this kind of snake-like polarization pattern. That's what they predicted. In February of 2013, I think, they produced this image. And it shook the world because if this were true this would be perhaps the most important image in the history of science. Because it would be the first detection of gravitational waves that would happen before LIGO. But this would be a signal from the very beginning of time. These would be gravitational waves generated when the universe was a millionth of a billionth of a billionth of a billionth of a second old and they'd allow us to test our ideas about the origin of the universe. You notice I said, "if it's true," because we just don't know. When these experimenters did this they were very excited. There's another way of presenting their data, it doesn't really matter what it is. It turns out this is called a multiple expansion, but there is the data and there is the prediction from inflation you see. It looks great. What are all these lines? That's noise from our galaxy. Our galaxy has dust in it and the dust can be polarized and it can produce a signal, too. But they argued that the dust was much smaller, and therefore they discovered something, and therefore they deserve the Nobel Prize. There was another group of people who were really pissed off. They were the people who produced that image I showed you, the Planck satellite, the image of the cosmic microwave background. They were looking for the same thing. It was the Holy Grail, if you'll forgive me, of cosmology. But they got very happy because they could actually measure dust in our galaxy because they could see over the entire sky. And when they looked at the dust they couldn't look at exactly the same region that the BICEP people did, but they said you know what there's enough dust. That dust can produce a signal, that up there is the one they see there. The dust in our galaxy could produce a signal that's the same magnitude as what the other guys saw. So they were excited because it meant these guys were wrong. Now, I want to present this, the reason I wanted to present this to you today is because it's the difference between science and religion. Because these guys hated these guys. And these guys wanted those guys to be wrong and those guys wanted these guys to be wrong. So what did they do? Did they cut each other's heads off? No. They said let's do a joint analysis. Because they didn't care who was right, they just wanted to know what was right. They didn't care in the end. They knew that one of them was wrong, maybe they were both wrong. But all they wanted to find out was what the answer was. And to me, therefore, even though many people say, "Oh, it's unfortunate that maybe this experiment was wrong," to me it's one of the great examples of the history of science because it shows how science works. So they got together and they came up with a joint analysis and it looks like this. This was the original signal. It was some number, the number R, or if you're a pirate "argh," and if it was nonzero then there are gravitational waves from the beginning of time and you see the original analysis. This is what's called a likelihood function. The highest probability was by far nonzero. Well when you included dust it changed, and the upper curve is that change. So this is a new analysis. Now, you see, it still peaked at nonzero, so why are we saying we discovered gravitational waves? Because this is physics, not medicine. I'll explain that in a second. This is a probability function and the highest probability is indeed nonzero, but you can ask what's the probability that R is actually 0 and this is all noise? It's about 8 percent. So the likelihood that R is not zero is 92 percent. If that were epidemiology, that would be a Nobel Prize. But this is physics. And if you're going to make an extraordinary claim, as Carl Sagan and others would have said, you've got to have extraordinary evidence. And 92 percent just doesn't cut it. You need 99.9995 percent confidence before we can say we made a discovery. That's what we needed before we claimed we discovered the Higgs. And so, if you actually look at their joint paper, which everyone says implies that gravitational waves haven't been seen, it really says exactly what I told you. There's an 8 percent chance that they're not there. And for physicists, that means there's no evidence that they're there. Because the other thing about science that's really important is we try and prove ourselves wrong as much as we try and prove ourselves right. And only after we've convinced ourselves, after trying to prove ourselves wrong, that we're not wrong do we claim we're right. And this just isn't good enough. But I want to close by asking what would we learn if that was really there? Because we don't know. We're doing new experiments to see if it's really there. New experiments with greater sensitivity. If this image, or some version of this image, is real, we have seen a signal from the beginning of time. And I think because it's late and I was going to show you some other neat experiments, but I think I won't. I'll just show you a picture of me because I like that. There I am. I'll show you. No, I was going to show you other ways you can do it because I want to end on this metaphysics thing. Because I wrote a book on the Universe from Nothing a bunch of years ago, which tried to take back these questions that religion observed a long time ago. Why is there something rather than nothing? And show that in fact science can say that it's easy. You don't need supernatural shenanigans to get something from nothing. But at the time, I wrote about the possibility that most of us think is true right now among physicists: That there are probably more than one universe, or probably many, many universes, out there. Something we call a multiverse. People kept saying, I remember once debating that awful guy William Lane Craig, and they say, 'Well, you know you involve the multiverse. It's just like God.' It's not. And I say, 'No, it's well-motivated.' But the point is it did sound just like, kind of, religious speculation. And the neat thing is it doesn't have to be, because if we go and measure gravitational waves for inflation then we may be able to know if other universes exist, which is what I find incredibly exciting. Because it turns out inflation is just a period when space expands exponentially fast. And it turns out that space is still expanding exponentially fast in most of the multiverse. But what happens is there's a local place where that exponential expansion stops. It's like a snowflake forming. In this case it's sort of like water melting right there. And when that happens, all the energy and empty space gets converted into particles and radiation in a big bang. So our universe originated when inflation ended at that point. But in other places in this multiverse, inflation is still going on and there may be today a universe just forming and it goes on in most of these models forever. It's eternal. And the really strange thing is, it turns out that the way inflation ends in each universe can produce different laws of physics in each universe. That may explain the properties of our universe because it may be, as it turns out, in some universes there may be a lot of galaxies and in some universes there may not be many because the conditions aren't right. And it could just be that the properties of our universe are what they are because if you didn't have galaxies you wouldn't have stars, if you didn't have stars you wouldn't have planets, if you didn't have planets you wouldn't have astronomers. So the universe is the way it is because there are astronomers here to measure it. Which sounds religious, but it's not. It's just cosmic natural selection. You would not expect to find yourself in a universe in which you couldn't live. That would be a book. But the neat thing is this speculation may now be in some sense testable. Not directly, because we'll never know those other universes exist, but if we could measure gravitational waves from inflation and demonstrate that inflation happened, and measure the properties of inflation, we'd be able to know if inflation is eternal. And if that's the case, we would know that there are other universes out there. It's just like the situation in 1905, when Einstein actually wrote his Ph.D. thesis on proving that atoms existed, but no one ever thought you'd ever be able to see atoms. But all the indirect evidence told the atoms were there. In this case you could have a theory, a grand unified theory, that would explain everything we can see about the universe in which we live. But one of the predictions, so make 50 predictions we can test, the 51st we might not be able to test, but we have huge indirect evidence that it's there. And so I'm amazed that we are potentially on the threshold of knowing whether we are alone in a cosmic sense. Whether there are other universes, or whether our universe is unique. And, of course, if there are a multitude of universes then that makes, of course, God even more redundant. So, let me close by going back to this picture. When I look at a picture like this I think about the civilizations that may have died there on these planets that may have been around these stars. I think about why the universe is the way it is, and it caused us to do the work we've done over the last 40 years. This is spiritual. This is all. But this beats the spirituality of religion because it's real. And that's what I want to leave you with today. Thank you very much.